Gram-negative bacteria produce membrane vesicles (MVs) from their outer membrane during growth, although the mechanism for MV production and the advantage that MVs provide for bacterial survival in vivo remain unknown. MVs function as an alternate secretion pathway for Gram-negative bacteria; therefore, MV production in vivo may be one method by which bacteria interact with eukaryotic cells. However, the interactions between MVs and cells of the innate and adaptive immune systems have not been studied extensively. In this study, we demonstrate that MVs from Salmonella typhimurium potently stimulated professional APCs in vitro. 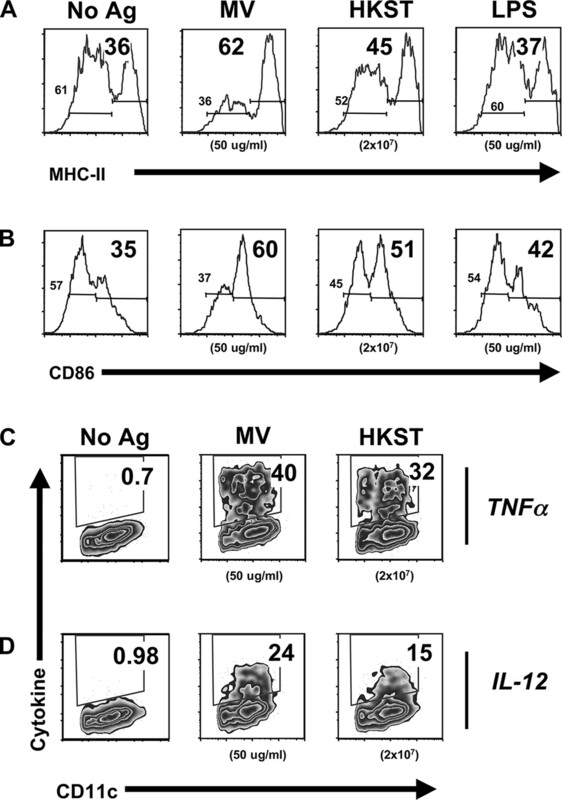 Similar to levels induced by bacterial cells, MV-stimulated macrophages and dendritic cells displayed increased surface expression of MHC-II and CD86 and enhanced production of the proinflammatory mediators NO, TNF-α, and IL-12. MV-mediated dendritic cell stimulation occurred by TLR4-dependent and -independent signals, indicating the stimulatory properties of Salmonella MVs, which contain LPS, do not strictly rely on signaling through TLR4. In addition to their strong proinflammatory properties, MVs contained Ags recognized by Salmonella-specific B cells and CD4+ T cells; MV-vaccinated mice generated Salmonella-specific Ig and CD4+ T cell responses in vivo and were significantly protected from infectious challenge with live Salmonella. Our findings demonstrate that MVs possess important inflammatory properties as well as B and T cell Ags known to influence the development of Salmonella-specific immunity to infection in vivo. Our findings also reveal MVs are a functional nonviable complex vaccine for Salmonella by their ability to prime protective B and T cell responses in vivo. Membrane vesicles (MVs)3 are discrete nonsomatic (separate from the bacterial cell) spherical nano-structures (50–250 nm diameter) composed of lipids and proteins derived from the bacterial periplasm and outer membrane (1, 2, 3). MV production is ubiquitous for all Gram-negative bacteria investigated to date (2, 3). The essential nature of MV production is supported by the lack of reports for Gram negatives that fail to make MVs (MV-null) and that an Escherichia coli transposon library screened for MV production failed to produce MV-null mutants (3, 4). These observations and the fact that MV production may be linked to bacterial replication (5, 6) support at least two nonmutually exclusive models in which MV production is either intrinsic to bacterial growth/viability or a multigene process unaffected by single-gene mutations (3, 7). Thus, despite a history of published reports spanning several decades, the mechanisms regulating MV production and formation are only beginning to be clarified (3, 6, 7, 8). Studies by Beveridge (2) and by Kesty and Kuehn (9) revealed that MVs from Pseudomonas aeruginosa and E. coli contain periplasmic enzymes, such as hemolysin, hydrolases, phosphatases, and phospholipases, as well as abundant outer membrane proteins (3). Other groups report MV production to be an alternate secretion pathway capable of directing bacterial products, including cytotoxins (10, 11), enzymes (5), and DNA (10, 12), to prokaryotic and eukaryotic cells. For example, Helicobacter pylori produce vacuolating cytotoxin A-containing MVs (13, 14), and E. coli and Salmonella typhi produce cytolysin A-containing MVs (15, 16), which are cytotoxic to mammalian cells. P. aeruginosa MVs are found in biofilm matrices (17), contain the quorum-sensing molecule 2-heptyl-3-hydroxy-4-quinolone (18), and fuse with unrelated Gram-negative and Gram-positive bacteria (19, 20), suggesting MVs function as signals in biofilm formation and interspecies intraspecies bacterial population biology. Despite these studies, the mechanisms by which natural bacterial components or heterologous model proteins are selectively expressed in MVs are not clearly defined for any species and preclude studies in which the ramifications of MV production in vivo can be selectively identified (3, 7). That MVs influence inflammation and disease in vivo is supported by several informative and intriguing studies. In response to H. pylori and P. aeruginosa MVs, epithelial cells produce IL-8, a cytokine important for neutrophil and monocyte recruitment in vivo (21, 22). Bioactive H. pylori vacuolating cytotoxin A-containing MVs bind to and are internalized by epithelial cells in vitro and are detectable in human gastric mucosa from H. pylori-infected individuals (13, 14). Porphymonas gingivalis MVs have proteolytic activity similar to whole bacterial cells, promote bacterial adherence to epithelial cells, and serve as toxin and enzyme delivery vehicles, suggesting a role in periodontal disease (23, 24, 25). Borrelia burgdorferi MV Ags are detected in the urine, blood, and tissues from infected mice, dogs, and humans, and in infected ticks (26). During meningococcal septicemia, blebbing menigococci release MVs in plasma, which contributes to the high endotoxin levels characteristic of these infections (27). Similarly, in several examples of rodent and human Gram-negative sepsis, nonsomatic bacterial murein lipoprotein, peptidoglycan-associated lipoprotein, and outer membrane protein A (OmpA) are tightly associated with LPS and released in the bloodstream or serum (28, 29, 30, 31, 32, 33). The murein lipoprotein-peptidoglycan-associated lipoprotein-OmpA-LPS complexes, putatively in the form of MVs, cause increased serum concentrations and macrophage (Mφ) production of proinflammatory cytokines contributing to disease immunopathogenesis. In addition, LPS-rich MVs are released from replicating Salmonella bacteria within intracellular compartments of infected epithelial cells (34). These studies (28, 29, 30, 31, 32, 33, 34) demonstrate MVs contain several compounds known to be recognized by host microbial pattern-recognition receptors (35, 36, 37, 38). Therefore, one may infer that Gram-negative MVs are physiologically relevant pathogen-associated molecular pattern (PAMP) complexes recognized by host defenses in vivo because it is likely that the composition of nonsomatic microbial components released during infection or sepsis differs substantially from purified or synthetic compounds routinely used to study host defense responses to PAMPs (27, 34, 39). Protective host defense mechanisms against Salmonella infection require both the innate and adaptive immune systems (40, 41, 42). Critical innate anti-Salmonella immune responses include the proinflammatory cytokines, TNF-α and IL-12 (43), as well as phagocyte activation and antimicrobial NO production (44, 45). Dendritic cells (DCs) are activated during Salmonella infection (43), produce proinflammatory cytokines, and are the most efficient APC for naive T cell stimulation (46). DCs are therefore intimately connected to the adaptive T and B cell mechanisms absolutely required for the control of Salmonella infection (41). CD4+ T cells and IFN-γ secretion play predominate roles (41), and combined B and T cell responses are required for protective host defense against Salmonella challenge (40, 42). Despite our current notions of host defense to Salmonella and knowledge of stimulatory ligands in MVs, little is known about the interactions of host-immune cells with MVs, which may influence the development of Salmonella-specific immunity during infection in vivo (47). Although MVs are produced by a wide range of bacterial pathogens (3), relatively few studies have focused on MVs produced by salmonellae (2, 15, 48). We have shown that Salmonella produces MVs containing OmpA and innate TLR ligands (49), and Ags in MVs are protected from protease digestion and also recognized by Ag-specific T cells (49). These data directly demonstrate that MVs contain TLR ligands and Salmonella T cell Ags, important findings that link MV properties with innate and adaptive host defense mechanisms. Based on the above observations, we hypothesized that Salmonella MVs are proinflammatory and immunogenic facsimiles of the parental bacteria, and therefore could stimulate development of both innate and adaptive immunity. We examined the ability of MVs to stimulate responses important for the activation of T cells, such as DC maturation (MHC-II, CD86) and proinflammatory cytokine production (TNF-α, IL-12) (46). We probed the antigenic content of MVs using Salmonella-specific T cells and sera from protectively immunized mice, and demonstrated that immunization with MVs primes Salmonella-specific T and B cell responses and protection against challenge with live bacteria. This is notable because historically nonviable vaccines fail to induce T cell immunity or protect susceptible mice from Salmonella infection (50, 51, 52, 53, 54). Our studies reveal that Salmonella MVs possess important proinflammatory and antigenic properties similar to the parent bacteria and demonstrate that MVs have the intrinsic combination of Ags and adjuvant properties required of an effective nonreplicating complex vaccine to stimulate Salmonella immunity. We propose that MVs could be an additional means to induce pathogen-specific immunity, and are therefore attractive vaccine candidates. Six- to 8-wk-old female C3H/HeJ and C3H/HeN mice were obtained from The Jackson Laboratory and used at 6–14 wk of age. Mice were immunized by oral infection with 109 Salmonella typhimurium SL3261 (an aroA derivative of SL1344) by gavage with feeding needles (22 × 11/2 with 11/4-mm ball; no. 7920; Popper & Sons). Immune mice were used at 70–100 days postimmunization. For MV immunizations, mice were injected with MVs (i.p., 100 μg) in PBS at 2-wk intervals and analyzed or challenged 1 wk later, a time when we observed no residual innate immune activation in serum or spleen. 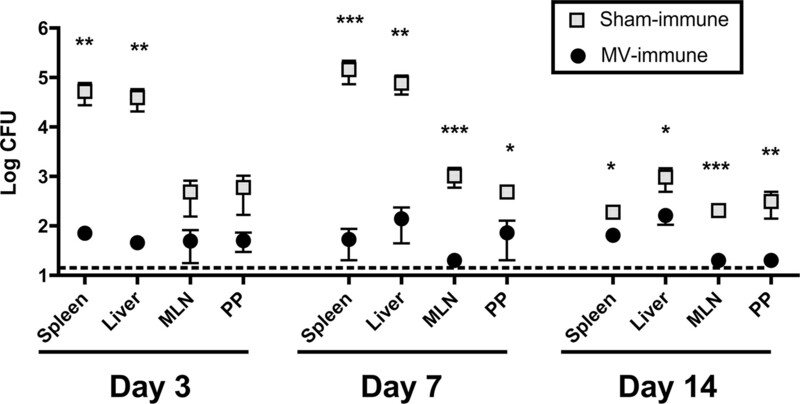 For protection experiments, reduction in bacterial replication was used as a measure of protective immunity, and MV-immune mice were infected via the i.p. route with ∼1 × 105 CFU SL3261, which allows the survival of infected animals (55, 56, 57, 58, 59, 60, 61). After MV immunization and live bacterial challenge (see above), bacterial burden in infected tissues was used as a measure of protective immunity. Briefly, at the indicated times postinfection, organs from individual mice were homogenized in sterile PBS/1% Triton-X-100 using a motorized homogenizer (Omni International). Homogenates were serially diluted in sterile PBS, and multiple titrations from each organ were plated on LB agar plates. CFU were determined after overnight incubation at 37°C. All mice were housed in specific pathogen-free conditions and cared for in accordance with University of Washington Institutional Animal Care and Use Committee guidelines. Somatic heat-inactivated (1 h at 65°C) Salmonella Ags (HKST) were prepared from S. typhimurium strain ST14028 grown overnight at 37°C without aeration in tryptic soy broth (BD Diagnostic Systems). In some studies, Salmonella Ags were prepared in minimal medium requiring the use of ST14028; however, we observe no antigenic differences between ST14028 and the immunizing/infecting strain SL3261 (see above) (49, 62, 63, 64). Salmonella LPS (Ultrapure; List Biological Laboratories) was stored at 4°C in sterile aliquots at 1 mg/ml. MVs were isolated from the cell-free supernatant of Salmonella cultures grown with aeration at 37°C in TSB medium. Briefly, log-phase cultures were pulsed with gentamicin (50 μg/ml final) for 30 min to increase MV production (65, 66). Bacterial cells were removed by centrifugation, and the supernatant was filtered through a.22-um pore-size filter (Corning Glass). MVs were enriched from the supernatant using ammonium sulfate precipitation and differential centrifugation, as previously reported (67). Ultimately, MVs were isolated by ultracentrifugation (100,000 × g, 2 h; Beckman Coulter). Purified MVs were reconstituted in sterile, nonpyrogenic water; lyophilized to determine total dry weight; and stored at 4°C in a 1 mg/ml working concentration in PBS. MV preparations routinely yielded >10 mg (dry weight)/L culture. For MV visualization by electron microscopy, MVs were negatively stained with 1% phosphotungstic acid (pH 7.0) and applied directly to 0.5% Formvar-coated 300-mesh copper grids. Samples were observed with a JEM-1200EXII transmission electron microscope (JEOL). Micrographs were taken at an accelerating voltage of 80 kV. J774 Mφs stimulated with MVs were used to reveal NO and TNF-α (4 h) production. To evaluate MV-induced DC activation, DCs (day 7) from GM-CSF (20 ng/ml)-cultured bone marrow (68) from C3H/HeN and C3H/HeJ (LPS hyporesponsive) (69) mice were used. RPMI 1640 supplemented with l-glutamine, 50 μM 2-ME, with antibiotics (100 U/ml penicillin, 100 μg/ml streptomycin, and 50 μg/ml gentamicin) and 10% FCS (RP-10) was used to culture Mφs, whereas only 5% FCS was added (RP-5) for DCs. NO (24 and 48 h) in the supernatants of J774 Mφs grown under the indicated stimulation conditions was detected by the Griess reaction (70) and quantified by comparison with a standard curve of NaNO2. Ag-specific IgG from control naive, Salmonella-immune, and MV-immune mice was measured from serum harvested at the indicated times. Briefly, blood was collected into sterile 1.5-ml microcentrifuge tubes and allowed to clot at room temperature. Clots were removed by centrifugation, and sera were stored at −20°C until use. For Ag-specific IgG determination, 96-well plates (Nunc Maxi-Sorp) were coated overnight at 4°C with HKST (2 × 107 CFU/well) or MVs (10 μg/well) in 50 μl of PBS. After washing six times with PBS plus 0.5% Tween 20 (PBST), plates were blocked 1 h at room temperature with PBS plus 10% FCS (250 μl, PBSF) and further washed six times with PBST. Serum samples were loaded (100 μl/well in triplicate) and incubated 1 h at room temperature, followed by washing six times with PBST. Secondary HRP-conjugated anti-mouse IgG Ab (Southern Biotechnology Associates) was added to wells (100 μl of a 1/2000 dilution in PBSF) for 1 h at room temperature, followed by washing (6× PBST). Ag-specific IgG was revealed by developing plates with 100 μl of tetramethylbenzidine/peroxidase substrate (Kirkegard & Perry Laboratories) for ∼5 min, and reaction was stopped with H3PO4 (100 μl of a 1 M solution). Color development OD was measured at 450 nm (OD450) on a 96-well format spectrophotometer (SpectraMax 250; Molecular Devices). Ag-specific IgG titer ranges were determined by serial 10-fold dilutions of serum samples. Production of cytokines by host cells in response to Salmonella Ags and MVs was detected by ICS using a method modified from Badovinac and Harty (71). Briefly, 4 × 106 splenocytes (in RP-10) taken directly ex vivo from Salmonella- or MV-immune mice or 2.5 × 105 Mφs or DCs (in RP-5) cultured from naive mice were coincubated with the indicated titrations of HKST, MVs, LPS, or Ab to murine CD3 (clone 145.2C11) in single wells of 96-well U-bottom tissue culture plates. During incubation at 37°C in 5% CO2, GolgiPlug was added at 1/1000 dilution for the final 6 h (splenocyte; total stimulation = 24 h) or 4 h (Mφ and DC), and cells were washed twice in cold PBS plus 0.5% (w/v) BSA (Sigma Aldrich) (PBSA), and surface stained in the presence of Fc block (clone 2.4G2) with PE-labeled Abs to murine CD4 (L3T4, clone H129.19) or CD11c (clone HL3). Stained cells were fixed on ice with 2% paraformaldehyde and permeabilized with Perm/Wash buffer, followed by staining with allophycocyanin-labeled Abs to murine IFN-γ (clone XMG1.2), TNF-α (clone MP6-XT22), or IL-12 (clone C15.6). Cells were resuspended in PBSA and stored at 4°C in the dark until analysis. For detection of DC maturation, DCs were surfaced stained with biotin-conjugated Abs to MHC-II (I-Ek, clone 14-4-4S) or to CD86 (clone B7-2) plus streptavidin-allophycocyanin after stimulation with Salmonella Ags, as described above. Unstained cells or cells stained with isotype control Ab (data not shown) were used as negative controls. All flow cytometry reagents and Abs were purchased from BD Pharmingen, unless otherwise noted. Data were acquired on a LSR 6-color analyzer (BD Biosciences) and analyzed using FlowJo Software (Tree Star). Sera from individual mice were harvested from peripheral blood. Serum TNF-α was quantified using the mouse TNF-α ELISA DuoSet Kit (R&D Systems), according to the manufacturer’s instructions. Values of p < 0.05 were considered significant and determined using Student’s t test and the ANOVA test for multiple comparisons. During infection, innate host defenses recognize several microbial components that signal “danger,” leading to an inflammatory response (35, 72). Mφs are critical phagocytes that recognize microbes, initiate innate inflammatory responses, and clear bacteria during Salmonella infection (73, 74, 75). We postulated that MVs produced by Salmonella are one bacterial-derived structure recognized by Mφs. Purified Salmonella MVs (see Materials and Methods) were visualized by electron microscopy revealing a characteristic shape and size (Fig. 1⇓A) similar to MVs from other Gram-negative bacteria (3, 49). When incubated with J774 Mφs, MVs stimulated production of large amounts of TNF-α (Fig. 1⇓B) and NO (Fig. 1⇓C), two important inflammatory mediators produced by activated Mφs (44, 45). These data reveal that MVs are potent stimulators of Mφs and have important intrinsic qualities as phagocyte activators. S. typhimurium produces MVs that possess intrinsic inflammatory properties. A, MVs produced by wild-type Salmonella were isolated and visualized by electron microscopy (see Materials and Methods); multiple fields are shown to indicate range of sizes (50–250 nm); bar = 250 nm. TNF-α (B) or NO (C) production by murine J774 Mφs was measured after 4-h (TNF-α) or 24- and 48-h (NO) stimulation with LPS (1 μg/ml), HKST (2 × 107/well), MVs (50 μg/ml), or no Ag as a negative control. Percentages indicate proportion of J774 cells producing TNF-α of total cells (B). NO production is presented as uM NO per 2 × 105 J774 Mφs (C). Data (B and C) are representative of three independent experiments. DCs express surface molecules and distinct inflammatory signals that influence the quality of adaptive immunity during infection, and thus occupy a functional position at the junction of innate and adaptive immunity (46). Previously, we determined that Salmonella MVs contain TLR ligands (49), which are known to stimulate DC activation and maturation (35). That Salmonella induce DC maturation and cytokine production is well characterized in vitro and in vivo (43), yet the outcome of interactions of MVs and DCs has not been directly examined. Therefore, we tested whether MVs are agonists for DC maturation and proinflammatory cytokine production. 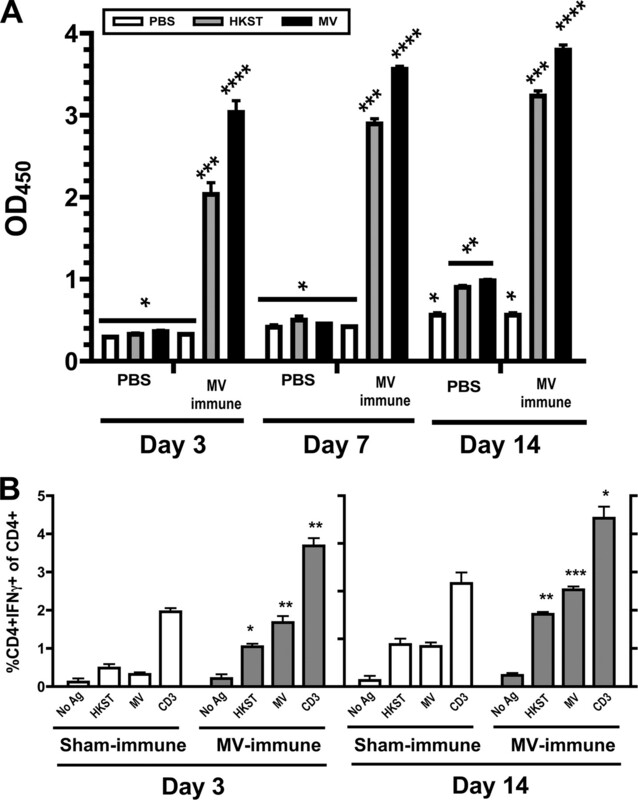 After incubation with MVs, DCs (see Materials and Methods) were efficiently stimulated to mature (increased MHC-II and CD86; Fig. 2⇓, A and B) and produce TNF-α and IL-12 (Fig. 2⇓, C and D), indicating MVs have potent proinflammatory properties. Importantly, in the absence of stimulation (No Ag), DCs expressed low surface levels of MHC-II (Fig. 2⇓A) and CD86 (Fig. 2⇓B), and did not produce detectable TNF-α (Fig. 2⇓C) and IL-12 (Fig. 2⇓D). MV-induced DC maturation (Fig. 2⇓, A and B) and activation (Fig. 2⇓, C and D) were similar to that induced by HKST and LPS (as a positive control). The levels of MV-induced DC activation were consistent with levels induced by whole bacteria in previous reports (43, 62, 76). However, compared with HKST and LPS, MVs retained DC maturation and activation properties over a 104-fold dilution range (Fig. 2⇓, line graphs), indicating MVs possess agonist activity over a larger range of concentrations. Salmonella MVs efficiently induce DC maturation and robust proinflammatory cytokine production. BMDCs from C3H/HeN mice were incubated overnight with the indicated stimulants and stained with fluorescently labeled Abs to CD11c and the DC maturation markers MHC-II (A) and CD86 (B). Histograms show percentages of gated CD11c+ DCs expressing low and high levels of each marker, and line graphs show titrations of stimulants starting at concentrations indicated in histograms. TNF-α and IL-12 production was detected by ICS staining. DCs were stained with fluorescently labeled Abs to CD11c and TNF-α (C) or IL-12 (D). Percentages in the marked region on the two-color dot plots indicate the proportion of CD11c+ DCs producing TNF-α or IL-12 after a 4-h incubation, and line graphs (right side) show titrations of stimulants starting at concentrations indicated in plots (left side). Data are representative of five independent experiments. The proinflammatory properties of Gram-negative bacteria are most often associated with the expression of canonical forms of LPS, which signals through TLR4 (35). However, bacteria contain several distinct PAMPs capable of activating phagocytes independent of TLR4 (77), and MVs contain both LPS (2) and TLR2 ligands (49). To determine whether the proinflammatory properties of MVs (Fig. 2⇑) were mediated exclusively through TLR4-dependent signaling pathways (35, 77), we performed stimulation experiments using DCs from mice that expressed a nonfunctional (dominant-negative) TLR4 (C3H/HeJ mice (69)). In response to MV stimulation, C3H/HeJ BMDCs expressed increased MHC-II and CD86 (Fig. 3⇓, A and B) and TNF-α and IL-12 (Fig. 3⇓, C and D). Importantly, after HKST stimulation and in contrast to purified LPS, C3H/HeJ DCs matured and produced proinflammatory cytokines, indicating any LPS present in either MVs or HKST does not mediate stimulation of C3H/HeJ DCs through TLR4. MV-activated C3H/HeJ DCs (Fig. 3⇓) had only slightly reduced maturation and activation magnitudes compared with C3H/HeN DCs (Fig. 2⇑), indicating non-LPS components have an important role in MV DC activation. However, the activity of all stimuli (HKST and MVs) was rapidly lost after serial dilution (data not shown) on C3H/HeJ DCs, in contrast to C3H/HeN (Fig. 2⇑), supporting the role of LPS as a potent inflammatory bacterial agonist signaling through TLR4 (69, 78). These results demonstrate Salmonella MVs are microbial structures that potently activate DCs in a TLR4-dependent (Fig. 2⇑) and -independent manner (Fig. 3⇓), and suggest MVs have the potential to activate DCs during Salmonella infection in vivo. Intrinsic proinflammatory properties of Salmonella MVs can function independently of signals through TLR4. BMDCs from TLR4-deficient C3H/HeJ mice were incubated overnight (A and B) or for 4 h (C and D) with the indicated stimulants. DCs were stained with fluorescently labeled Abs to CD11c and DC maturation markers MHC-II (A) and CD86 (B), or were stained using ICS to detect TNF-α (C) and IL-12 (D) production. Histograms show percentages of gated CD11c+ DCs expressing low and high levels of each marker, and two-color dot plots indicate the proportion of CD11c+ DCs producing TNF-α or IL-12 after 4-h incubation. Data are representative of five independent experiments. Salmonella infection induces Ag-specific B and T cell immunity (79), and protective immunity to virulent Salmonella challenge requires both humoral and cell-mediated responses (40, 41, 42, 80, 81). Therefore, we tested whether B cell responses that develop during Salmonella infection recognize Ags expressed in MVs by measuring total Salmonella-specific and MV-specific IgG in sera from Salmonella-immune (ST-immune) mice. ST-immune sera, in contrast to sera from naive control mice, strongly recognized Ags present in both HKST and MVs (Fig. 4⇓A), indicating that during Salmonella infection, B cells are primed to Ags expressed in MVs. Previously, we determined that splenocytes from Salmonella-immune mice contain polyclonal Salmonella-specific CD4+ T cells (49, 62, 64) that, in response to specific Ag, can be detected by expression of IFN-γ using ICS (62). We examined the CD4+ T cell responses from Salmonella-immune splenocytes to determine whether stimulatory Ags were expressed in MVs. Abundant Salmonella-specific CD4+IFN-γ+ T cells from Salmonella-immune mice responded to total bacterial Ag (HKST) and MVs (Fig. 4⇓B). Importantly, CD4+IFN-γ+ T cells were detected in the presence of anti-CD3 Ab (positive control), but not in the absence of Salmonella Ag, nor in splenocytes from naive mice, demonstrating the specificity of this assay. We observed similar results in Salmonella-immune C3H/HeJ (TLR4-deficient) and C57BL/6 mice (H-2b) (data not shown). These data reveal viable Salmonella infection stimulates mice to develop strong humoral and cell-mediated responses to Ags expressed in MVs. From these data, we conclude that Ags targeted by host defenses during live infection with Salmonella are present in MVs. MVs possess stimulatory Ags recognized by T and B cells from Salmonella-immune mice. A, Total Ag-specific IgG in sera from naive or Salmonella-immune (ST-immune) mice (C3H/HeN) were tested for reactivity to HKST or MV Ags by ELISA (see Materials and Methods). Sera from individual mice were run in triplicate for reactivity to each Ag. Data are represented as means ± SEM of three mice in each group. Titer ranges are presented as asterisks, as follows: ∗, <10; ∗∗, >100; ∗∗∗, >1,000; ∗∗∗∗, >10,000. B, Ag-specific CD4+ T cell production of IFN-γ, detected by ICS, was measured in splenocytes from naive control or Salmonella-immune mice (C3H/HeN). Ags used were HKST (2 × 107 CFU/well), MVs (50 μg/ml), and anti-CD3 Ab as a positive control. Numbers in marked region indicate percentage of CD4+IFN-γ+ of total CD4+ splenocytes. Data are representative of three individual mice per group. Representative data presented are from two (A) and five (B) independent experiments. MVs consist of Ags recognized by sera and T cells from Salmonella-immune mice (Fig. 4⇑) (49); however, it is possible that adaptive responses to Ags expressed in MVs are primed strictly by live Salmonella during infection. Therefore, we tested whether MV-immunized mice develop Salmonella-specific B and T cell responses in the absence of bacterial infection. Mice were immunized (i.p.) with MVs and PBS (sham immune) and boosted 2 wk later via the same route. After 1 wk, immune sera and CD4+ T cells were assessed for Salmonella-specific responses. Similar to Salmonella-immune mice (Fig. 4⇑), MV-immune mice developed strong Salmonella-specific B cell responses indicated by abundant IgG specific for HKST and MVs (Fig. 5⇓A). 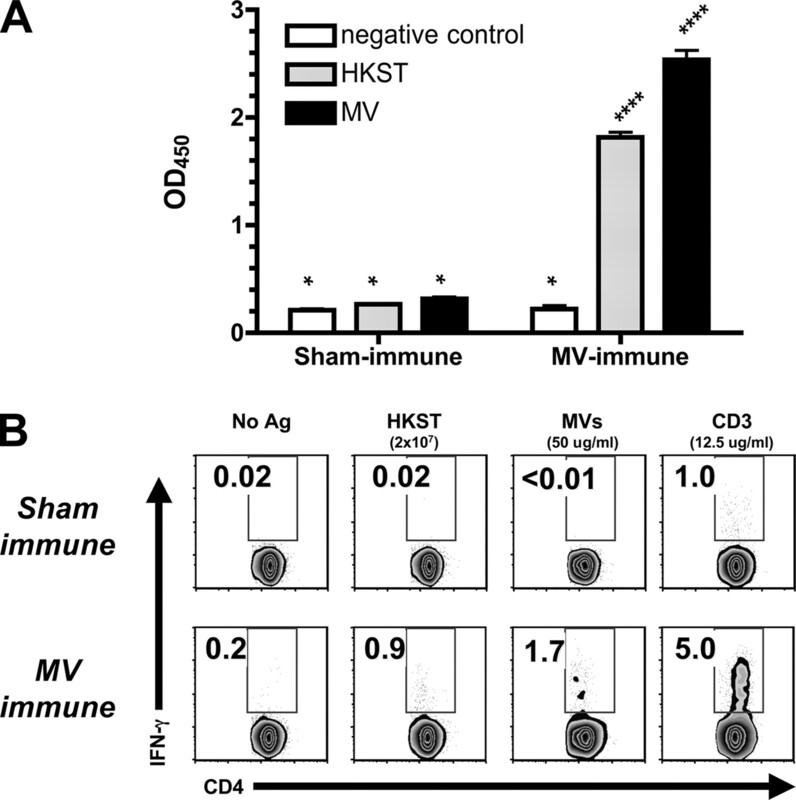 In addition, MV-immune mice exhibited Ag-specific CD4+ T cell responses to HKST and MVs indicated by the increased number of CD4+IFN-γ+ T cells (Fig. 5⇓B). MV immunization primes Salmonella-specific B and T cell responses in vivo (Fig. 5⇓) and suggests MVs may have a role in instructing the quality and magnitude of host defenses during Salmonella infection. However, to determine the impact of host responses to MVs during infection would optimally require a Salmonella mutant strain that does not make MVs, yet retains normal antigenic, growth, and colonization phenotypes. Thus, due to the limited known mechanisms governing MV production and that MV-null mutants have not been isolated for any bacterial species (3, 4, 7), we cannot definitively determine that during live infection host responses to MVs influence the course of Salmonella infection at this time. Mice immunized with MVs develop Salmonella-specific T and B cell immunity. Mice (C3H/HeN) were immunized with MVs (100 μg/mouse) via the i.p. route at a 2-wk interval. One week after last injection, splenocytes and sera were harvested from individual mice. A, Total Ag-specific IgG in sera from sham-immune or MV-immune mice were tested for reactivity to Ags, as in Fig. 4⇑A. Sera from individual mice were run in triplicate for reactivity to each Ag. Data are represented as means ± SEM of three mice in each group. Titer ranges are presented as asterisks, as follows: ∗, <10; ∗∗, >100; ∗∗∗, >1,000; ∗∗∗∗, >10,000. B, Ag-specific CD4+ T cell production of IFN-γ, detected by ICS, was measured in splenocytes from sham-immune control or MV-immune mice. Responses were detected to Ags, as in Fig. 4⇑, B and C. Anti-CD3 Ab and No Ag were included in the T cell ICS as positive and negative controls, respectively. Plots from one representative mouse of three are presented, and numbers in marked region indicate percentage of CD4+IFN-γ+ of total CD4+ splenocytes. Data presented are representative of two independent experiments. Because protective host defense mechanisms may selectively target somatic Ags associated exclusively with Salmonella bacteria, and absent from MVs, we examined the ability of adaptive immune responses produced by potently immunogenic MVs (Figs. 4⇑ and 5⇑) to provide protection to live Salmonella challenge in vivo. MV-immune mice increased Salmonella-specific IgG and CD4+ T cell responses during live Salmonella challenge (Fig. 6⇓), indicating that MV-induced B and T cells respond to infection with live bacteria. Because it is firmly established that protectively immunized mice inhibit bacterial replication during live Salmonella challenge (41), we determined organ CFU as a measure of protective immunity in MV-immune mice infected with viable Salmonella SL3261, which allows the survival of infected animals (55, 56, 57, 58, 59, 60, 61). In contrast to sham-immunized controls, MV-immune mice had decreased bacterial CFU in all organs measured after infection with live Salmonella (Fig. 7⇓). Innate activation due to MV injection (measured by serum TNF-α and APC activation; Fig. 8⇓) subsides before day 7, and thus is unlikely to account for a meaningful portion of protective immunity. Our study establishes that MVs efficiently activate Mφs and DCs (Figs. 1–3⇑⇑⇑) and are highly immunogenic facsimiles of the parent bacteria (Figs. 4–6⇑⇑⇓), and reveals that MVs can prime (independent of coinfection) protective host defense mechanisms that function to inhibit bacterial replication in vivo (Fig. 7⇓). These are significant findings in light of previous observations that only viable bacteria were capable of generating protective immunity against Salmonella (50, 51, 52, 53, 54). Overall, these observations suggest that MVs contain protective Ags that are targeted during live infection, and MVs have intrinsic properties known to be important mediators of DC, B, and T cell activation during Salmonella infection in vivo, and demonstrate the potential utility of MVs as natural complex vaccines. MV-immune mice exhibit strong Salmonella-specific adaptive immune responses during challenge with live bacteria. A, Total Ag-specific IgG in sera from sham-immune or MV-immune mice at the indicated days after Salmonella infection were tested for reactivity to Ags, as in Fig. 4⇑A. Sera from individual mice were run in triplicate for each Ag. Data are represented as means ± SEM of three mice in each group. Titer ranges are presented as asterisks, as follows: ∗, <10; ∗∗, >100; ∗∗∗, >1,000; ∗∗∗∗, >10,000. 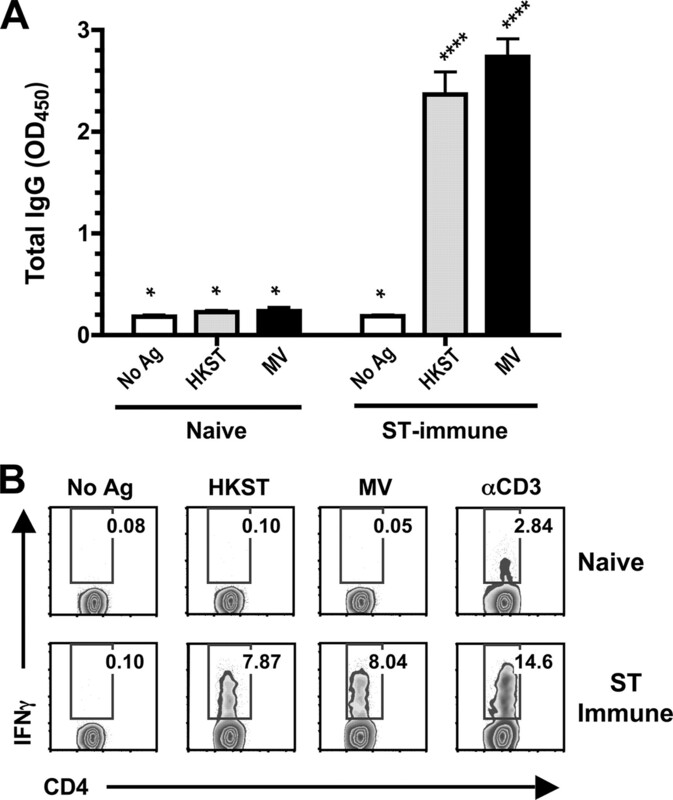 B, Ag-specific CD4+ T cell production of IFN-γ, detected by ICS, was measured in splenocytes from individual sham-immune or MV-immune mice at the indicated days postinfection. Responses to Ags were detected as in Fig. 4⇑, B and C. Data are represented as means ± SEM of three mice in each group, and numbers on y-axis indicate percentage of CD4+IFN-γ+ of total CD4+ splenocytes. Data presented are representative of three independent experiments. Statistics were determined for comparisons between groups for each Ag at the indicated days. ∗, p ≤ 0.05; ∗∗, p ≤ 0.005; ∗∗∗, p ≤ 0.0005. Innate activation is quiescent by day 7 post-MV injection. C3H/HeN mice were injected with PBS or MVs (i.p., 100 μg). A, Sera were collected from individual mice in PBS control (PBS) and MV-injected (MV) groups at day 1 and 7 postinjection and analyzed for TNF-α levels as an indicator of innate proinflammatory activation. 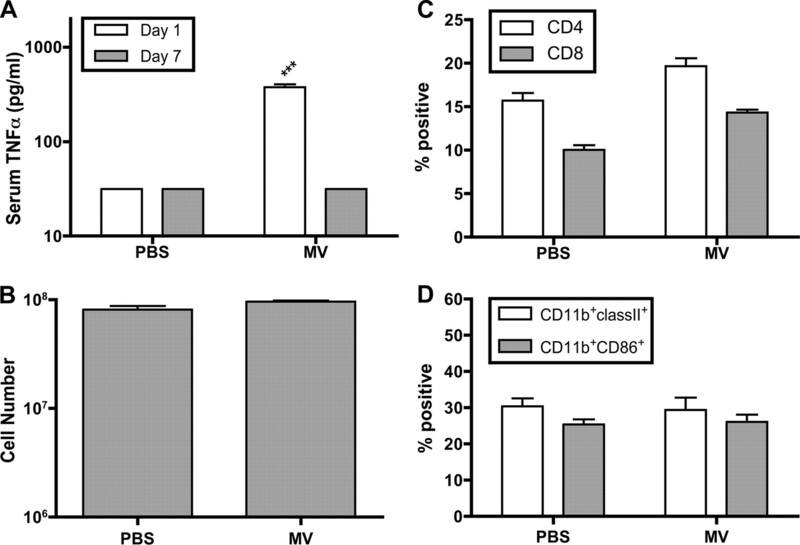 At day 7 postinjection, spleens were harvested from individual mice in the PBS and MV groups and assessed for total cellularity (B), proportion of CD4+ and CD8+ T cells (C), and activated CD11b+ phagocytes (D). ∗∗∗, p ≤ 0.0005. MV-immune mice are protected from infection with live Salmonella. Sham-immune or MV-immune mice were challenged with live Salmonella (SL3261, i.p. ), and protection was measured by quantitative culture of organ bacterial burden in spleen, liver, mesenteric lymph node, and Peyer’s patches at the indicated days postinfection. Data are presented as means ± SEM for each group and are representative of two independent experiments. ∗, p ≤ 0.05; ∗∗, p ≤ 0.005; ∗∗∗, p ≤ 0.0005. The study of Gram-negative MVs spans many decades, and several groups have demonstrated that MVs function as an alternate bacterial secretion system (1, 2, 3). Even as the role of MVs in bacterial physiology and the mechanisms regulating their production are becoming more apparent (7), the interactions between MVs and host defenses need greater study. This is particularly important because pathogenic Gram-negative bacteria such as salmonellae interact with host-immune systems at several stages of the infectious cycle (79). In this study, we present several novel findings demonstrating the outcome of interactions between S. typhimurium MVs and host defense mechanisms. First, MVs potently stimulate innate proinflammatory responses from professional APCs such as Mφs and DCs (NO, TNF-α, and IL-12; Figs. 1–3⇑⇑⇑), and efficiently stimulate DC maturation (MHC-II and CD86) and activation (TNF-α, IL-12), in the presence (C3H/HeN DCs; Fig. 2⇑) or absence (C3H/HeJ DCs; Fig. 3⇑) of signals through TLR4-dependent pathways. Thus, multiple TLR ligands contribute significantly to the stimulatory activity for MVs. Although Salmonella-infected DCs are activated and mature both in vitro and in vivo (82), this is the first demonstration that MVs, natural complex structures elaborated from Salmonella (49), are sufficient to robustly activate and mature DCs. DCs are critical in the initiation of microbial-specific immunity in vivo because DCs use uniquely powerful APC functions to efficiently activate adaptive immune responses (46, 82). This suggests that the robust proinflammatory properties of Salmonella MVs for DC activation may be important for host responses to Salmonella infection. Optimally, to definitively determine the influence of MVs on DC activation during live infection in vivo would require experimental infection with a MV-null Salmonella strain. However, due to the intractable nature of this type of experiment, we are unable to address this issue at this time (3, 4, 7). In another respect, many DC studies have focused on their interaction with purified microbial products that may not necessarily be relevant form(s) of PAMPs encountered in vivo; thus, it is likely that DCs detect complexes of PAMPs or TLR ligands (28, 29, 30, 31, 32, 33, 35, 36). Therefore, in contrast to purified TLR agonists, MVs may be a more biologically relevant form of LPS, lipoprotein, or peptidoglycan recognized by host defenses during Salmonella infection and systemic spread. DC activation occurs in vivo during Salmonella infection (82), and Salmonella MVs induce DC activation in vitro (Figs. 2⇑ and 3⇑) and MVs are found in vivo during other Gram-negative infections (13, 14, 26, 34) and in peripheral blood from septic hosts (26, 27, 28, 29, 30, 31, 32, 33). Together with our data (Figs. 2⇑ and 3⇑), these observations suggest DCs may be activated, not just by intact infecting bacteria in vivo, but also by a MV-mediated pathway. We propose that uninfected DCs and Mφs activated by MVs may be important for host defense during infection in vivo because Salmonella-infected DC/Mφs readily die by caspase-1-dependent pyroptosis (83, 84, 85, 86), and thus these host cells may have a reduced activation period. Furthermore, Salmonella-infected DCs are limited in Ag presentation, phagosomal maturation, and MHC-II surface expression through the bacterial production of inhibitory type III secretion system effector proteins encoded on Salmonella-pathogenicity island 2 (87, 88, 89, 90, 91). Therefore, MV-activated DCs may be important in immunity because Salmonella-infected DCs, although known to be activated (82), get directly exposed to inhibitory bacterial virulence mechanisms (83, 84, 85, 87, 88, 89, 90, 91), and may be qualitatively less efficient at APC functions or have a limited lifespan for B and T cell activation. Based on previous work demonstrating that Salmonella expresses Ags in MVs recognized by Salmonella-specific CD4+ T cell lines derived from protectively immunized mice (49), we examined the ability of MVs to contribute to the development of Salmonella-specific adaptive immune responses in vivo. We demonstrate that MVs: 1) contain B cell and T cell Ags recognized by immune mice, and 2) after immunization prime Salmonella-specific immune responses that limit bacterial replication in vivo. MVs stimulate IFN-γ production by a large proportion of CD4+ T cells from Salmonella-immune mice, indicating MVs are an abundant source of Ags recognized by Salmonella-specific CD4+ T cells (Fig. 4⇑). In addition, MVs are a rich source of B cell Ags (Figs. 4–6⇑⇑⇑). Importantly, naive mice immunized with MVs develop robust Salmonella-specific B and T cell responses, indicating MVs prime immunity independent of bacterial infection, a demonstration that suggests Salmonella Ags expressed in MVs may also play a meaningful role in the host response during infection. Furthermore, consistent with their ability to prime Salmonella-specific adaptive immunity, immunization with MVs also engenders protective immunity in mice. MV-immune mice had decreased bacterial replication in mucosal and peripheral lymphoid organs after challenge with live Salmonella (Fig. 7⇑). This finding demonstrates that MVs have intrinsic immunogenic properties as natural, complex vaccines against Salmonella. Several aspects of MV-induced Salmonella-specific B and T cell responses remain to be determined, and our current lines of investigation aim to verify the exact humoral and cellular mechanisms responsible for protection and whether MVs are an enriched or select source of immunogenic Salmonella Ags. Elucidating the vaccine potential of Salmonella MVs is important for several reasons. In the U.S., the Centers for Disease Control and Protection estimate the number of nontyphoidal salmonellosis (NTS) cases to be ∼1.4 million per year, and NTS is the leading cause of food-borne infections with lethal outcome (92). Furthermore, incidence of NTS is rapidly increasing and a worldwide health concern; therefore, new vaccine strategies are recommended (92). We have determined that MVs have highly stable proinflammatory and immunogenic properties for several months at 4°C and after lyophilization (data not shown); both are desirable vaccine qualities (93). Salmonella also offers a promising vaccine platform due to its highly amenable genetic nature with which to introduce or exclude a variety of gene products that may affect MV vaccine efficacy (94, 95, 96, 97). Another potential advantage of using MVs as vaccines is the substantial immunity induced by this nonreplicating vaccine vehicle (Fig. 7⇑) because, historically, nonreplicating vaccines fail to induce meaningful levels of immunity for protection against pathogens that require cell-mediated defenses, such as Salmonella (50, 51, 52, 53, 54, 93). Unlike immunization with the currently licensed Neisseria meningitidis MVs that provide protective immunity against meningococcal disease mainly by inducing high titers of serum bactericidal Abs (98, 99), immunization with Salmonella MVs induces both humoral and cell-mediated immunity (Figs. 5⇑ and 6⇑). Furthermore, MVs have a potential important role in vaccine research because nonreplicating vaccines represent an important immunization strategy as the number of chronically immunocompromised individuals increases (congenital immunodeficiencies, immunosuppressive therapies, chemotherapy, radiation therapy, asplenia) (100, 101, 102). Increased numbers of HIV+ populations in developing countries, including patients who submit to vaccination without prior knowledge of their HIV status, are at particular risk for vaccine-induced disease after immunization with replicating vaccine vectors (100, 101, 102). In the U.S., the current “General Recommendations on Immunization” published by the Advisory Committee on Immunization Practices state that in contrast to inactivated vaccines that are safe for immunocompromised persons, live vaccines are contraindicated because they may cause complications related to enhanced vector replication (102, 103). This is particularly the case for live attenuated bacterial vaccines (bacillus Calmette-Guerin, Salmonella vectors) for which the primary response is cell mediated (103). Overall, we demonstrate that Salmonella MVs are potent proinflammatory and immunogenic bacterial structures, which are effective inducers of protective immunity. Our results add to the growing body of literature indicating MVs are important in several bacterial infection studies (2, 3, 7). MV production by bacteria is likely to be energy intensive (3), suggesting MVs may have additional roles in general microbial welfare or other, as yet unidentified, functions. MVs may serve a role during periods of rapid outer membrane reorganization for Salmonella, a facultative intracellular pathogen, dynamically responding to host defenses or environments (104) or in the transition from an extracellular to an intracellular phase (62, 105), a period of global gene expression changes (106) and surface modifications (62, 105) critical to bacterial survival and virulence (105). Therefore, MVs may be depots of bacterial material exported from the outer membrane to limit host detection or to free space for newly synthesized bacterial components that provide a survival advantage for Salmonella. Whatever their extra functions, our observations suggest that during infection Salmonella MVs may function as an additional bacterial mechanism to instruct innate and adaptive immune responses. These findings also allow us to question the current prevailing notion that priming host immunity is strictly dependent on microbial TLR ligands and Ags coupled/fixed to the bacterial soma. We thank members of the Cookson laboratory for their support and review of the manuscript. ↵1 This work was supported by National Institutes of Health Grant AI47242 (to B.T.C.) and National Institutes of Health Bacterial Pathogenesis Training Grant AI055396 (to B.L.D.). ↵3 Abbreviations used in this paper: MV, membrane vesicle; DC, dendritic cell; HKST, heat-inactivated Salmonella Ag; ICS, intracellular cytokine staining; Mφ, macrophage; NTS, nontyphoidal salmonellosis; OmpA, outer membrane protein A; PAMP, pathogen-associated molecular pattern. Beveridge, T. J., J. L. Kadurugamuwa. 1996. Periplasm, periplasmic spaces, and their relation to bacterial wall structure: novel secretion of selected periplasmic proteins from Pseudomonas aeruginosa. Microb. Drug Resist. 2: 1-8. Beveridge, T. J.. 1999. Structures of Gram-negative cell walls and their derived membrane vesicles. J. Bacteriol. 181: 4725-4733. Kuehn, M. J., N. C. Kesty. 2005. Bacterial outer membrane vesicles and the host-pathogen interaction. Genes Dev. 19: 2645-2655. McBroom, A. J., A. P. Johnson, S. Vemulapalli, M. J. Kuehn. 2006. Outer membrane vesicle production by Escherichia coli is independent of membrane instability. J. Bacteriol. 188: 5385-5392. Li, Z., A. J. Clarke, T. J. Beveridge. 1996. A major autolysin of Pseudomonas aeruginosa: subcellular distribution, potential role in cell growth and division and secretion in surface membrane vesicles. J. Bacteriol. 178: 2479-2488. Katsui, N., T. Tsuchido, R. Hiramatsu, S. Fujikawa, M. Takano, I. Shibasaki. 1982. Heat-induced blebbing and vesiculation of the outer membrane of Escherichia coli. J. Bacteriol. 151: 1523-1531. Mashburn-Warren, L. M., M. Whiteley. 2006. Special delivery: vesicle trafficking in prokaryotes. Mol. Microbiol. 61: 839-846. Hoekstra, D., J. W. van der Laan, L. de Leij, B. Witholt. 1976. Release of outer membrane fragments from normally growing Escherichia coli. Biochim. Biophys. Acta 455: 889-899. Kesty, N. C., M. J. Kuehn. 2004. Incorporation of heterologous outer membrane and periplasmic proteins into Escherichia coli outer membrane vesicles. J. Biol. Chem. 279: 2069-2076. Kolling, G. L., K. R. Matthews. 1999. Export of virulence genes and Shiga toxin by membrane vesicles of Escherichia coli O157:H7. Appl. Environ. Microbiol. 65: 1843-1848. Kesty, N. C., K. M. Mason, M. Reedy, S. E. Miller, M. J. Kuehn. 2004. Enterotoxigenic Escherichia coli vesicles target toxin delivery into mammalian cells. EMBO J. 23: 4538-4549. Renelli, M., V. Matias, R. Y. Lo, T. J. Beveridge. 2004. DNA-containing membrane vesicles of Pseudomonas aeruginosa PAO1 and their genetic transformation potential. Microbiology 150: 2161-2169. Fiocca, R., V. Necchi, P. Sommi, V. Ricci, J. Telford, T. L. Cover, E. Solcia. 1999. Release of Helicobacter pylori vacuolating cytotoxin by both a specific secretion pathway and budding of outer membrane vesicles: uptake of released toxin and vesicles by gastric epithelium. J. Pathol. 188: 220-226. Keenan, J., T. Day, S. Neal, B. Cook, G. Perez-Perez, R. Allardyce, P. Bagshaw. 2000. A role for the bacterial outer membrane in the pathogenesis of Helicobacter pylori infection. FEMS Microbiol. Lett. 182: 259-264. Wai, S. N., B. Lindmark, T. Soderblom, A. Takade, M. Westermark, J. Oscarsson, J. Jass, A. Richter-Dahlfors, Y. Mizunoe, B. E. Uhlin. 2003. Vesicle-mediated export and assembly of pore-forming oligomers of the enterobacterial ClyA cytotoxin. Cell 115: 25-35. Wai, S. N., M. Westermark, J. Oscarsson, J. Jass, E. Maier, R. Benz, B. E. Uhlin. 2003. Characterization of dominantly negative mutant ClyA cytotoxin proteins in Escherichia coli. J. Bacteriol. 185: 5491-5499. Schooling, S. R., T. J. Beveridge. 2006. Membrane vesicles: an overlooked component of the matrices of biofilms. J. Bacteriol. 188: 5945-5957. Mashburn, L. M., M. Whiteley. 2005. Membrane vesicles traffic signals and facilitate group activities in a prokaryote. Nature 437: 422-425. Kadurugamuwa, J. L., T. J. Beveridge. 1999. Membrane vesicles derived from Pseudomonas aeruginosa and Shigella flexneri can be integrated into the surfaces of other Gram-negative bacteria. Microbiology 145: 2051-2060. Li, Z., A. J. Clarke, T. J. Beveridge. 1998. Gram-negative bacteria produce membrane vesicles which are capable of killing other bacteria. J. Bacteriol. 180: 5478-5483. Bauman, S. J., M. J. Kuehn. 2006. Purification of outer membrane vesicles from Pseudomonas aeruginosa and their activation of an IL-8 response. Microbes Infect. 8: 2400-2408. Ismail, S., M. B. Hampton, J. I. Keenan. 2003. Helicobacter pylori outer membrane vesicles modulate proliferation and interleukin-8 production by gastric epithelial cells. Infect. Immun. 71: 5670-5675. Grenier, D., D. Mayrand. 1987. Functional characterization of extracellular vesicles produced by Bacteroides gingivalis. Infect. Immun. 55: 111-117. Inagaki, S., S. Onishi, H. K. Kuramitsu, A. Sharma. 2006. Porphyromonas gingivalis vesicles enhance attachment, and the leucine-rich repeat BspA protein is required for invasion of epithelial cells by “Tannerella forsythia”. Infect. Immun. 74: 5023-5028. Grenier, D., J. Bertrand, D. Mayrand. 1995. Porphyromonas gingivalis outer membrane vesicles promote bacterial resistance to chlorhexidine. Oral Microbiol. Immunol. 10: 319-320. Dorward, D. W., T. G. Schwan, C. F. Garon. 1991. Immune capture and detection of Borrelia burgdorferi antigens in urine, blood, or tissues from infected ticks, mice, dogs, and humans. J. Clin. Microbiol. 29: 1162-1170. Hellman, J., P. M. Loiselle, M. M. Tehan, J. E. Allaire, L. A. Boyle, J. T. Kurnick, D. M. Andrews, K. Sik Kim, H. S. Warren. 2000. Outer membrane protein A, peptidoglycan-associated lipoprotein, and murein lipoprotein are released by Escherichia coli bacteria into serum. Infect. Immun. 68: 2566-2572. Hellman, J., P. M. Loiselle, E. M. Zanzot, J. E. Allaire, M. M. Tehan, L. A. Boyle, J. T. Kurnick, H. S. Warren. 2000. Release of Gram-negative outer-membrane proteins into human serum and septic rat blood and their interactions with immunoglobulin in antiserum to Escherichia coli J5. J. Infect. Dis. 181: 1034-1043. Hellman, J., J. D. Roberts, Jr, M. M. Tehan, J. E. Allaire, H. S. Warren. 2002. Bacterial peptidoglycan-associated lipoprotein is released into the bloodstream in Gram-negative sepsis and causes inflammation and death in mice. J. Biol. Chem. 277: 14274-14280. Hellman, J., M. M. Tehan, H. S. Warren. 2003. Murein lipoprotein, peptidoglycan-associated lipoprotein, and outer membrane protein A are present in purified rough and smooth lipopolysaccharides. J. Infect. Dis. 188: 286-289. Hellman, J., H. S. Warren. 2001. Outer membrane protein A (OmpA), peptidoglycan-associated lipoprotein (PAL), and murein lipoprotein (MLP) are released in experimental Gram-negative sepsis. J. Endotoxin Res. 7: 69-72. Hellman, J., E. M. Zanzot, P. M. Loiselle, S. F. Amato, K. M. Black, Y. Ge, J. T. Kurnick, H. S. Warren. 1997. Antiserum against Escherichia coli J5 contains antibodies reactive with outer membrane proteins of heterologous Gram-negative bacteria. J. Infect. Dis. 176: 1260-1268. Garcia-del Portillo, F., M. A. Stein, B. B. Finlay. 1997. Release of lipopolysaccharide from intracellular compartments containing Salmonella typhimurium to vesicles of the host epithelial cell. Infect. Immun. 65: 24-34. Underhill, D. M., A. Ozinsky. 2002. Toll-like receptors: key mediators of microbe detection. Curr. Opin. Immunol. 14: 103-110. Mastroeni, P., C. Simmons, R. Fowler, C. E. Hormaeche, G. Dougan. 2000. Igh-6−/− (B-cell-deficient) mice fail to mount solid acquired resistance to oral challenge with virulent Salmonella enterica serovar typhimurium and show impaired Th1 T-cell responses to Salmonella antigens. Infect. Immun. 68: 46-53. Mastroeni, P., B. Villarreal-Ramos, C. E. Hormaeche. 1992. Role of T cells, TNFα and IFNγ in recall of immunity to oral challenge with virulent salmonellae in mice vaccinated with live attenuated aro− Salmonella vaccines. Microb. Pathog. 13: 477-491. McSorley, S. J., M. K. Jenkins. 2000. Antibody is required for protection against virulent but not attenuated Salmonella enterica serovar typhimurium. Infect. Immun. 68: 3344-3348. Sundquist, M., A. Rydstrom, M. J. Wick. 2004. Immunity to Salmonella from a dendritic point of view. Cell. Microbiol. 6: 1-11. Mastroeni, P., A. Vazquez-Torres, F. C. Fang, Y. Xu, S. Khan, C. E. Hormaeche, G. Dougan. 2000. Antimicrobial actions of the NADPH phagocyte oxidase and inducible nitric oxide synthase in experimental salmonellosis. II. Effects on microbial proliferation and host survival in vivo. J. Exp. Med. 192: 237-248. Vazquez-Torres, A., J. Jones-Carson, P. Mastroeni, H. Ischiropoulos, F. C. Fang. 2000. Antimicrobial actions of the NADPH phagocyte oxidase and inducible nitric oxide synthase in experimental salmonellosis. I. Effects on microbial killing by activated peritoneal macrophages in vitro. J. Exp. Med. 192: 227-236. Mastroeni, P., B. Villarreal-Ramos, C. E. Hormaeche. 1993. Adoptive transfer of immunity to oral challenge with virulent salmonellae in innately susceptible BALB/c mice requires both immune serum and T cells. Infect. Immun. 61: 3981-3984. Vesy, C. J., R. L. Kitchens, G. Wolfbauer, J. J. Albers, R. S. Munford. 2000. Lipopolysaccharide-binding protein and phospholipid transfer protein release lipopolysaccharides from Gram-negative bacterial membranes. Infect. Immun. 68: 2410-2417. Bergman, M. A., L. A. Cummings, S. L. Barrett, K. D. Smith, J. C. Lara, A. Aderem, B. T. Cookson. 2005. CD4+ T cells and Toll-like receptors recognize Salmonella antigens expressed in bacterial surface organelles. Infect. Immun. 73: 1350-1356. Harrison, J. A., B. Villarreal-Ramos, P. Mastroeni, R. Demarco de Hormaeche, C. E. Hormaeche. 1997. Correlates of protection induced by live Aro− Salmonella typhimurium vaccines in the murine typhoid model. Immunology 90: 618-625. Matsui, K., T. Arai. 1992. The comparison of cell-mediated immunity induced by immunization with porin, viable cells and killed cells of Salmonella typhimurium. Microbiol. Immunol. 36: 269-278. Robertsson, J. A., A. A. Lindberg, S. Hoiseth, B. A. Stocker. 1983. Salmonella typhimurium infection in calves: protection and survival of virulent challenge bacteria after immunization with live or inactivated vaccines. Infect. Immun. 41: 742-750. Thatte, J., S. Rath, V. Bal. 1993. Immunization with live versus killed Salmonella typhimurium leads to the generation of an IFN-γ-dominant versus an IL-4-dominant immune response. Int. Immunol. 5: 1431-1436. Thatte, J., S. Rath, V. Bal. 1995. Analysis of immunization route-related variation in the immune response to heat-killed Salmonella typhimurium in mice. Infect. Immun. 63: 99-103. Al-Ramadi, B. K., M. J. Fernandez-Cabezudo, A. Ullah, H. El-Hasasna, R. A. Flavell. 2006. CD154 is essential for protective immunity in experimental Salmonella infection: evidence for a dual role in innate and adaptive immune responses. J. Immunol. 176: 496-506. Dybing, J. K., N. Walters, D. W. Pascual. 1999. Role of endogenous interleukin-18 in resolving wild-type and attenuated Salmonella typhimurium infections. Infect. Immun. 67: 6242-6248. Fernandez-Cabezudo, M. J., A. Ullah, R. A. Flavell, B. K. Al-Ramadi. 2005. Evidence for the requirement for CD40-CD154 interactions in resistance to infections with attenuated Salmonella. J. Endotoxin Res. 11: 395-399. Hess, J., C. Ladel, D. Miko, S. H. Kaufmann. 1996. Salmonella typhimurium aroA− infection in gene-targeted immunodeficient mice: major role of CD4+ TCR-αβ cells and IFN-γ in bacterial clearance independent of intracellular location. J. Immunol. 156: 3321-3326. MacFarlane, A. S., M. G. Schwacha, T. K. Eisenstein. 1999. In vivo blockage of nitric oxide with aminoguanidine inhibits immunosuppression induced by an attenuated strain of Salmonella typhimurium, potentiates Salmonella infection, and inhibits macrophage and polymorphonuclear leukocyte influx into the spleen. Infect. Immun. 67: 891-898. Mastroeni, P., J. A. Harrison, J. H. Robinson, S. Clare, S. Khan, D. J. Maskell, G. Dougan, C. E. Hormaeche. 1998. Interleukin-12 is required for control of the growth of attenuated aromatic-compound-dependent salmonellae in BALB/c mice: role of γ interferon and macrophage activation. Infect. Immun. 66: 4767-4776. Vidric, M., A. T. Bladt, U. Dianzani, T. H. Watts. 2006. Role for inducible costimulator in control of Salmonella enterica serovar Typhimurium infection in mice. Infect. Immun. 74: 1050-1061. Alaniz, R. C., L. A. Cummings, M. A. Bergman, S. L. Rassoulian-Barrett, B. T. Cookson. 2006. Salmonella typhimurium coordinately regulates FliC location and reduces dendritic cell activation and antigen presentation to CD4+ T cells. J. Immunol. 177: 3983-3993. Bergman, M. A., L. A. Cummings, R. C. Alaniz, L. Mayeda, I. Fellnerova, B. T. Cookson. 2005. CD4+-T-cell responses generated during murine Salmonella enterica serovar Typhimurium infection are directed towards multiple epitopes within the natural antigen FliC. Infect. Immun. 73: 7226-7235. Cummings, L. A., S. L. Barrett, W. D. Wilkerson, I. Fellnerova, B. T. Cookson. 2005. FliC-specific CD4+ T cell responses are restricted by bacterial regulation of antigen expression. J. Immunol. 174: 7929-7938. Martin, N. L., T. J. Beveridge. 1986. Gentamicin interaction with Pseudomonas aeruginosa cell envelope. Antimicrob. Agents Chemother. 29: 1079-1087. Kadurugamuwa, J. L., T. J. Beveridge. 1997. Natural release of virulence factors in membrane vesicles by Pseudomonas aeruginosa and the effect of aminoglycoside antibiotics on their release. J. Antimicrob. Chemother. 40: 615-621. Moe, G. R., P. Zuno-Mitchell, S. N. Hammond, D. M. Granoff. 2002. Sequential immunization with vesicles prepared from heterologous Neisseria meningitidis strains elicits broadly protective serum antibodies to group B strains. Infect. Immun. 70: 6021-6031. Granger, D. L., R. R. Taintor, K. S. Boockvar, J. B. Hibbs, Jr. 1996. Measurement of nitrate and nitrite in biological samples using nitrate reductase and Griess reaction. Methods Enzymol. 268: 142-151. Gallucci, S., P. Matzinger. 2001. Danger signals: SOS to the immune system. Curr. Opin. Immunol. 13: 114-119. Wijburg, O. L., C. P. Simmons, N. van Rooijen, R. A. Strugnell. 2000. Dual role for macrophages in vivo in pathogenesis and control of murine Salmonella enterica var. Typhimurium infections. Eur. J. Immunol. 30: 944-953. Eisenstein, T. K., L. M. Killar, B. A. Stocker, B. M. Sultzer. 1984. Cellular immunity induced by avirulent Salmonella in LPS-defective C3H/HeJ mice. J. Immunol. 133: 958-961. Yrlid, U., M. Svensson, C. Johansson, M. J. Wick. 2000. Salmonella infection of bone marrow-derived macrophages and dendritic cells: influence on antigen presentation and initiating an immune response. FEMS Immunol. Med. Microbiol. 27: 313-320. Barton, G. M., R. Medzhitov. 2002. Toll-like receptors and their ligands. Curr. Top. Microbiol. Immunol. 270: 81-92. Vazquez-Torres, A., B. A. Vallance, M. A. Bergman, B. B. Finlay, B. T. Cookson, J. Jones-Carson, F. C. Fang. 2004. Toll-like receptor 4 dependence of innate and adaptive immunity to Salmonella: importance of the Kupffer cell network. J. Immunol. 172: 6202-6208. Kaufmann, S. H., B. Raupach, B. B. Finlay. 2001. Introduction: microbiology and immunology: lessons learned from Salmonella. Microbes Infect. 3: 1177-1181. Mittrucker, H. W., B. Raupach, A. Kohler, S. H. Kaufmann. 2000. Cutting edge: role of B lymphocytes in protective immunity against Salmonella typhimurium infection. J. Immunol. 164: 1648-1652. Wick, M. J.. 2002. The role of dendritic cells during Salmonella infection. Curr. Opin. Immunol. 14: 437-443. Brennan, M. A., B. T. Cookson. 2000. Salmonella induces macrophage death by caspase-1-dependent necrosis. Mol. Microbiol. 38: 31-40. Fink, S. L., B. T. Cookson. 2005. Apoptosis, pyroptosis, and necrosis: mechanistic description of dead and dying eukaryotic cells. Infect. Immun. 73: 1907-1916. Fink, S. L., B. T. Cookson. 2006. Caspase-1-dependent pore formation during pyroptosis leads to osmotic lysis of infected host macrophages. Cell. Microbiol. 8: 1812-1825. Van der Velden, A. W., M. Velasquez, M. N. Starnbach. 2003. Salmonella rapidly kill dendritic cells via a caspase-1-dependent mechanism. J. Immunol. 171: 6742-6749. Bueno, S. M., J. A. Tobar, M. I. Iruretagoyena, A. M. Kalergis. 2005. Molecular interactions between dendritic cells and Salmonella: escape from adaptive immunity and implications on pathogenesis. Crit. Rev. Immunol. 25: 389-403. Tobar, J. A., L. J. Carreno, S. M. Bueno, P. A. Gonzalez, J. E. Mora, S. A. Quezada, A. M. Kalergis. 2006. Virulent Salmonella enterica serovar typhimurium evades adaptive immunity by preventing dendritic cells from activating T cells. Infect. Immun. 74: 6438-6448. Mitchell, E. K., P. Mastroeni, A. P. Kelly, J. Trowsdale. 2004. Inhibition of cell surface MHC class II expression by Salmonella. Eur. J. Immunol. 34: 2559-2567. Hensel, M.. 2000. Salmonella pathogenicity island 2. Mol. Microbiol. 36: 1015-1023. Cheminay, C., A. Mohlenbrink, M. Hensel. 2005. Intracellular Salmonella inhibit antigen presentation by dendritic cells. J. Immunol. 174: 2892-2899. Rabsch, W., H. Tschape, A. J. Baumler. 2001. Non-typhoidal salmonellosis: emerging problems. Microbes Infect. 3: 237-247. Ulmer, J. B., U. Valley, R. Rappuoli. 2006. Vaccine manufacturing: challenges and solutions. Nat. Biotechnol. 24: 1377-1383. Curtiss, R., III, S. M. Kelly, S. A. Tinge, C. O. Tacket, M. M. Levine, J. Srinivasan, M. Koopman. 1994. Recombinant Salmonella vectors in vaccine development. Dev. Biol. Stand. 82: 23-33. Dougan, G., L. Smith, F. Heffron. 1989. Live bacterial vaccines and their application as carriers for foreign antigens. Adv. Vet. Sci. Comp. Med. 33: 271-300. Dougan, G., S. Chatfield, D. Pickard, J. Bester, D. O’Callaghan, D. Maskell. 1988. Construction and characterization of vaccine strains of Salmonella harboring mutations in two different aro genes. J. Infect. Dis. 158: 1329-1335. Wilson, D. R., S. Chatfield, J. Betts, A. Griffiths, K. Y. Leung, G. Dougan, B. B. Finlay. 1990. Alternative methods of attenuating Salmonella species for potential vaccine use. Res. Microbiol. 141: 827-830. Feiring, B., J. Fuglesang, P. Oster, L. M. Naess, O. S. Helland, S. Tilman, E. Rosenqvist, M. A. Bergsaker, H. Nokleby, I. S. Aaberge. 2006. Persisting immune responses indicating long-term protection after booster dose with meningococcal group B outer membrane vesicle vaccine. Clin. Vaccine Immunol. 13: 790-796. Holst, J., B. Feiring, J. E. Fuglesang, E. A. Hoiby, H. Nokleby, I. S. Aaberge, E. Rosenqvist. 2003. Serum bactericidal activity correlates with the vaccine efficacy of outer membrane vesicle vaccines against Neisseria meningitidis serogroup B disease. Vaccine 21: 734-737. McFarland, E.. 1999. Immunizations for the immunocompromised child. Pediatr. Ann. 28: 487-496. Loutan, L.. 1997. Vaccination of the immunocompromised patient. Biologicals 25: 231-236. Wolfe, S., A. Bhatt. 2005. Evolving recommendations for vaccinating the immunocompromised patient. J. Public Health Manag. Pract. 11: 566-570. Kamath, A. T., U. Fruth, M. J. Brennan, R. Dobbelaer, P. Hubrechts, M. M. Ho, R. E. Mayner, J. Thole, K. B. Walker, M. Liu, P. H. Lambert. 2005. New live mycobacterial vaccines: the Geneva consensus on essential steps towards clinical development. Vaccine 23: 3753-3761. Rakeman, J. L., S. I. Miller. 1999. Salmonella typhimurium recognition of intestinal environments. Trends Microbiol. 7: 221-223. Ernst, R. K., T. Guina, S. I. Miller. 2001. Salmonella typhimurium outer membrane remodeling: role in resistance to host innate immunity. Microbes Infect. 3: 1327-1334. Eriksson, S., S. Lucchini, A. Thompson, M. Rhen, J. C. Hinton. 2003. Unravelling the biology of macrophage infection by gene expression profiling of intracellular Salmonella enterica. Mol. Microbiol. 47: 103-118.